Here's a vegtable you probably won't find in the supermarkets back home. Sometimes called 'nigauri' in Japan, but more often people say 'goya' which is what it's called in Okinawa, where it was made popular. 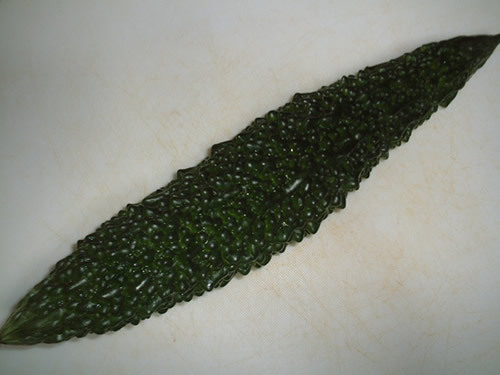 Goya is characterized by its extremely bitter taste, but it's also thought to be one of the reasons that people in Okinawa live so long, hence it's rising popularity throughout Japan. It's probably best not to eat it raw, you'll probably never eat it again. Try cooking it Okinawa style, fried with eggs, pork (Okinawa's just love their pork), a little soya sauce and rice wine, pretty tasty actually! 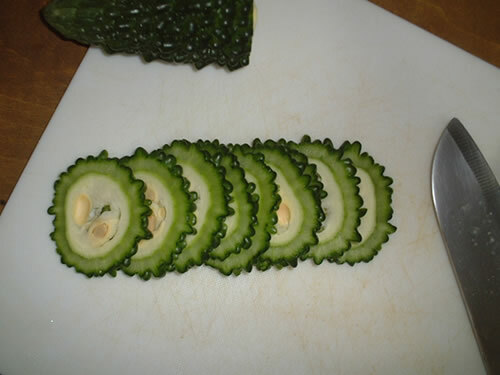 When you're preparing it, cut it into rings as shown, make sure you take out the seeds, you won't like them if you eat them either. Goya's health benefits? Tons of vitamin C, and possible benefits against high blood pressure, diabetes and cancer. Here's to long life!